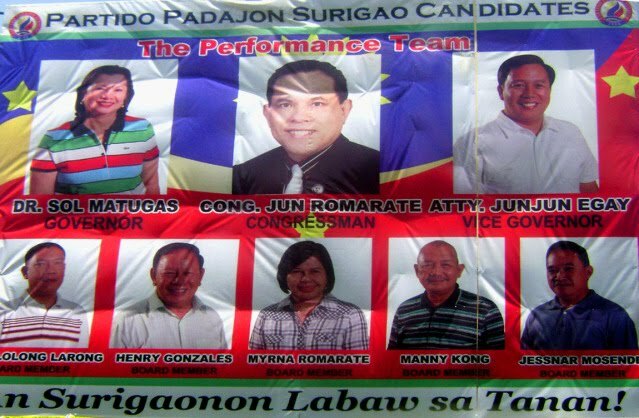 In both Surigao City and Province, the contest is between two families. The Barbers’ and the Matugas’. The political description can be summarized. For the Barbers family, it is survival. For the Matugas family, it is expansion. Before 2004, there were three Barbers in power and zero for Matugas. There was the late Senator Robert Barbers, Rep. Robert Ace Barbers and Gov. Robert Lyndon Barbers. This triumvirate ended when Sen. Bobby Barbers failed to make it in the magic 12 in 2004. This power is further decimated in 2007. Robert Ace swapped with his brother Lyndon with the latter running for Congressman and the former for Governor. Ace made it but Lyndon got the surprise of his life when he was roundly defeated by a virtual unknown, then Tubod Mayor and now Congressman Guillermo Romarate. For the Matugas family, the last time they held power was in 2001 when then Gov. Francisco Matugas held his last term as Governor. He ran as Congressman but lost to Ace Barbers. His brother Ernesto who ran for Governor lost to Lyndon in 2001. Redemption came in 2007 when Francisco “Lalo” Matugas ran for Congressman and won handily with a margin of more than 20,000 votes from his closest opponents. Two factors are working for him that year. One, Dinagat Island separated from Surigao del Norte thus took away the block voting of Ecleo’s PBMA group who were the allies of the Barbers and two, the infighting in the Barbers camp that split the group into two. Matugas capitalized on this two advantageous factors. Matugas ally in the 2nd District, Rep. Guillermo Romarate also won over Robert Lyndon Barbers by a mile. Now, the two families are on collision course again. In District 1, Barbers camp fielded lawyer Constantino Navarro III against Rep. Francisco Matugas while Surigao City Mayor Alfonso Casurra will challenge Rep. Romarate in the 2nd District. The big fight will be in the province, with Robert Ace Barbers running under the banner of the Nacionalista Party defending his position against Sol Forcadilla Matugas, the wife of Rep. Matugas of Lakas Kampi CMD. In the city, Robert Lyndon Barbers (NP) tries his luck against Ernesto Matugas (Lakas) for the Mayoralty race. It will be the 2nd time that the two face each other since the 2001 derby won by Lyndon. 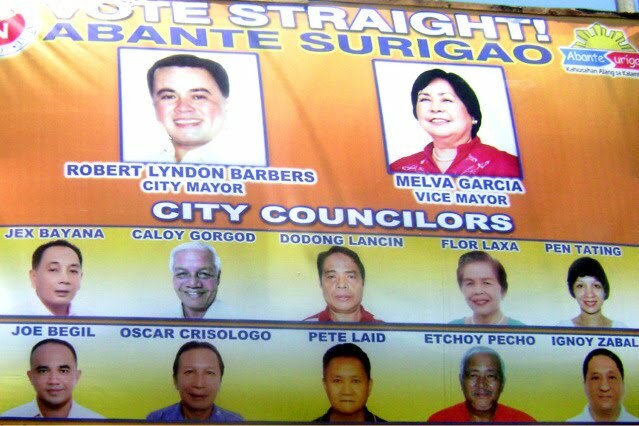 Giving a spoiler is a third force, the group of Vice Mayor Rico Salvador Sering who is running under the Liberal Party. Last but not the least, there is lawyer Eduardo Arriba, a former lawyer of the Matugas family and political strategist, who joined in the fray in the mayoralty race. Some groups warned Arriba might surprise them all. So this 2010 election is survival for the Barbers, expansion for the Matugases. In the middle of this colliding forces are the Surigaonons who have witness a ping pong ball of dirty and vengeful politics. For an insider, there is no difference of the two groups. Both are as vicious and as vindictive as the other. Once in power, the only pre occupation is how to destroy and decimate the other and its supporters without tangible public service. Original transcript can be found here.